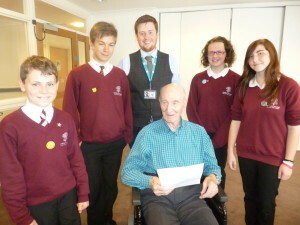 Reg shares his wartime stories with pupils from Oakfield. Former Second World War pilot Reg Gilbert captivated Frome school children with tales of his wartime heroics to mark the 70th anniversary of D-Day. Reg, who now lives at Rossetti House care home, served in the Royal Air Force flying Harvards in 1944, and he was a flying instructor and taught many people to fly at the Central Flying School. Pupils from Oakfield Academy, who are working on a special project to mark the Normandy landings, interviewed Reg about his experiences fighting in Northern France. Reg, who was 20 years-old at the time said, “I can’t quite believe it’s been 70 years since I was flying over the channel, preparing to fight for my country on the shores of France. Deputy home manager Jane Priddey-Thomas said, “It was wonderful to listen to all Reg’s stories about his time serving in the war. All our residents have such incredible stories, it’s so important we recognise them.